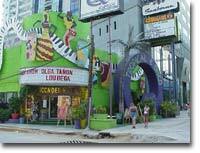 Welcome to the Acapulco Nightlife page. Mandara : Located on the Las Brisas hillside above Acapulco bay, the giant picture windows provide an unparalleled view of the bay while you party the night away. Mandara has a great light show and sound system . 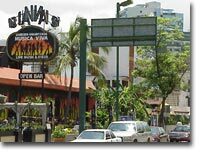 . . a piano bar, "Siboney", that draws an up-scale crowd above the disco, and plenty of atmosphere. Definitely one of the top places to dance the night away and if you are one to party until the clubs close, you will find the after-hours club "El Privado" conveniently located here. . . it opens at 4:30 am (when all of the clubs close) and lets you continue shaking your booty until noon. Palladium: Located near the Mandara, the 160 foot wide glass provides views that promise not to disappoint. The Palladium does seem to draw a younger, slightly rowdier crowd . . . a different flavor, but one preferred by many over the Mandara. If you identify with the Spring Break party crowd, the Palladium is the place for you. Baby'O : Located at 22 Costera Miguel Aleman, Baby'O is for those who prefer a more intimate setting. Not that Baby'O isn't a popular hangout, but it's less hectic than the large clubs that have music pounding so loud you can't hear yourself order a drink. The caveman theme creates a dance floor surrounded by cave-like nooks with tables and five bars. El Alebrije : 3308 Costera Miguel Aleman. The dress code here forbids t-shirts, shorts, jeans, sandals and tennis shoes. The arena type setting allows for a capacity of 1200 people and often hosts live performances. If you are near the Hard Rock Cafe after 10:00 PM, see if they will let you stick your head in the door and take a look, you might want to stay. Cover charge of $190.00 MXP with a free bar from 10:00 PM to 4:00 AM. Costera M. Aleman near the Hard Rock Cafe. The cover charge varies (depending on the season), but they have an open bar once your in. 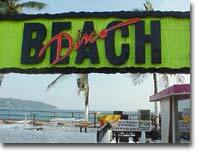 They have a bar with dancing overlooking the beach, and a bar with dancing underneath that is actually open to the beach. 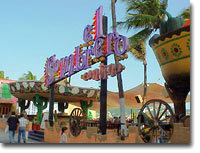 Located 2 doors south of the El Sombrero Restaurant.